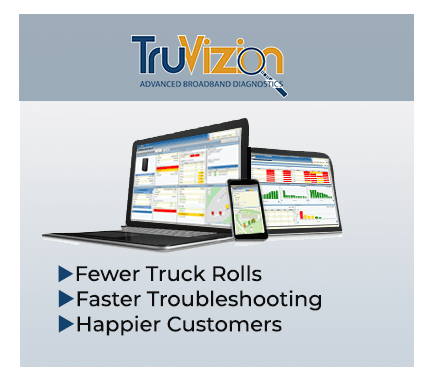 TruVizion is a patented and award winning diagnostics application that offers broadband operators comprehensive data on the health of their network and CPE. The real-time and historical information in TruVizion’s intuitive interface, along with advanced mapping capabilities, helps staff from multiple disciplines do their job better and more efficiently. 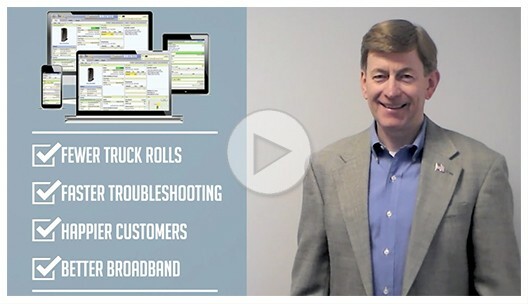 You will resolve outages more quickly, reduce the number and length of truck rolls, improve the quality of new installations, and increase efficiency in the Call Center, all of which lead to lower costs and a better experience for your customers. 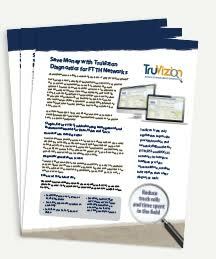 Read about TruVizion’s network diagnostics features for DOCSIS, DSL and Fiber broadband networks. 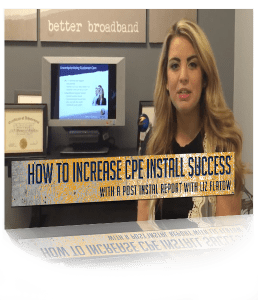 See how TruVizion’s Post-Install report can increase CPE install success with your subscribers. Outages happen. Sometimes they’re beyond your control, like when a storm moves through. TruVizion’s patented technology includes reporting and mapping that helps you zero in on which parts of your service area are being affected. Sending your repair technicians to the right place faster will reduce downtime and operational costs. TruVizion will help your Call Center staff handle calls more quickly and efficiently. They can see the current status of a device and its stability over time, bandwidth use, current and historical RF readings, VoIP and WiFi statistics, and compare readings with nearby devices. A shorter call and faster resolution means lower Call Center costs for you, and happier customers. In TruVizion you can see your current and historical codeword error data for subscribers and ports, both correctable and uncorrectable. This allows you to stay on top of errors that can be an indicators of future problems, or a current service-affecting issue. TruVizion’s patented technology includes features for Cable, DSL and Fiber providers. Does your company offer two or three of those services? Even better. Then you’ll have one, integrated tool to troubleshoot all your broadband networks. You may have heard it said that those who cannot remember the past are condemned to repeat it. TruVizion remembers the past so you don’t have to. You’ll have up to 90 days of historical modem readings right when you really need them. You can chart a modem’s readings over time with one click, and with one more click you can compare those readings with five other nearby modems. TruVizion’s Post-install report shows you how a modem was performing on the first day of install. Armed with this information you can quickly address service issues and determine when additional training is needed. As you improve your installs, you’ll save money by reducing truck rolls to fix install issues. In TruVizion you can see all of the devices on your network in one report, including the manufacturer, model and firmware level. Plus, you can see who has them and where they are located in your plant. This helps you better manage the devices and firmware in your network. Mapping is really only useful if you can use the map to resolve issues. In TruVizion you can filter out the noise by mapping only specific subscribers based on things like the online status of the modem, RF alert levels, network location and even the modem vendor and model. It’s the perfect tool for tracking down and resolving outages and those pesky network issues. With the live data, historical reporting and mapping in TruVizion, we don’t have to send our techs out in the field to chase down problems. We had a storm outage the other day and we were able to pinpoint where an amp was down before our crew ever left the building. A great money and time saver.